The nose has sultanas, raisins, dried plum and hints of oranges and vanilla. The mouthfeel is thin with no cling. The body has sultanas, rum and raisin ice-cream, and hints of cinnamon. The finish has cinnamon, sultanas and rum. Water brings out thin, compact whorling that dissipates before mottling. The nose gains peaches and hints of grass, and the vanilla is more prominent. Nothing was lost. The body gains peach and a little apricot, and the sultanas are quieter. The finish gains peach and loses most of the cinnamon. 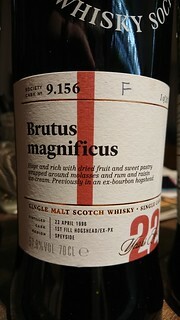 A really nice dram that balances an interesting set of fruits with grace and elegance.